We understand that most of you choose Gozo over Malta for its peace and tranquillity. However, Malta also has some treasures to explore, so why not leave it in our hands to provide you with a hassle-free day tour in Malta? We have different tours to offer you. All our tours are private and chauffeur-driven. Apart from the following tours, you also have the option to create your own tour. We also offer the flexibility to arrange the tours to your liking. This tour focuses on some of Malta’s charms as well as picturesque views in the southern part of Malta, away from the hustle and bustle of the cities. It includes caves, temples, and cliffs. This cave, translated to English as ‘Cave of Darkness’, is a prehistoric site containing the bone remains of animals that were stranded and subsequently became extinct in Malta at the end of the Last Glacial Maximum. It is also here that the earliest evidence of human settlement on Malta, some 7400 years ago, was discovered. Take note of entrance fees below. A UNESCO World Heritage Site, inscribed as part of ‘The Megalithic Temples of Malta’ in the World Heritage List. One of the prehistoric chambers at Ħaġar Qim holds an elliptical hole which is hewn out in alignment with the Summer Solstice sunrise. At sunrise, on the first day of summer, the sun’s rays pass through this hole and illuminate a stone slab inside the chamber. A downhill walk away is the smaller temple of Mnajdra. You have the option to choose either Ghar Dalam or Hagar Qim & Mnajdra Temples. However, if you wish we can also offer both options. The tour will proceed with a drive through the Zurrieq Promenade to witness the beautiful coastal views of the southern part of the island. Here you will also see the uninhabited smallest island of the archipelago, Filfla. The island is protected and access is only possible by a special permit for educational or scientific purposes. 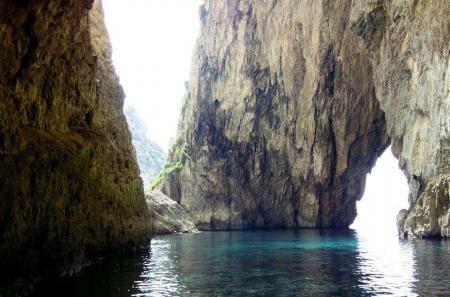 A number of sea caverns are found here and can be accessed by boat. The location of this fascinating natural grotto combines with sunlight and the surrounding chain of caves to reflect the phosphorescent colours of the submerged flora and the deep dark shade of blue of the sea. The boat ride will take about 25 mins until you arrive at the grotto. While it is an option to take the boat ride to the grotto, we do recommend it. Take note of boat ride fees below. We will head our way back to the ferry/your accommodation in Malta through the breath-taking views of Dingli Cliffs. This is the highest point of the Maltese Islands at around 253 metres above sea-level, marked by the tiny chapel on the edge dedicated to St. Mary Madgalene. Lunch is not included in the price, however, we can stop at one of the locations for a small snack. You are free to bring your own snacks. We can also offer you a packed lunch at an extra cost if you wish. This tour focuses mainly on the northern part of the island. It includes a bit of everything; local heritage, the roots of Christianity in Malta and also a little bit of medieval Malta. The Mosta Dome is the third largest rotunda dome in the world. This church is famous for its survival during the Second World War when a 200kg bomb fell through the dome without exploding. All the 300 people attending morning mass were left unharmed. The original bomb was removed and a replica is now on display inside the church as a famous tourist attraction. San Anton Palace is the residence of the Maltese President and is surrounded by one of the most beautiful gardens in Malta with a large variety of beautiful flowers and plants. The palace can be viewed from the garden. Here you can find different kinds of crafts and beautiful artefacts created by local experts. You can watch the craftsmen blowing and forming glass, visit the goldsmith’s filigree and beautiful jewellery and have a look at the beautiful sculptures and lace. Find that special souvenir to take back home to remember your holiday in Malta. The largest and earliest archaeological evidence of Christianity in Malta. These were used in Roman times to lay the dead to rest, as the Romans thought it unhygienic to bury the dead in the city. According to tradition, St Paul stayed here during his three months in Malta, when he was shipwrecked on the island in 60 AD. The martyr St Agatha is said to have hidden in these catacombs during the persecution of the Christians by the Roman Emperor Decius in 249 AD. From the Grotto you can also take a set of stairs leading under the road to the Second World War air raid shelters and Wignacourt Museum. Take some time to visit the Church of St Paul that is built on top of the grotto. Visit to the grotto is not applicable to tours booked on a Sunday. The old capital of Malta, nicknamed as the ‘Silent City’ for the silence one can find in this pedestrian fortified city. You have two hours to roam freely and get lost in the maze of alleys. There are a number of attractions one can find here such as the Cathedral and the 360 degree view from the bastions. Anyone who loves history will surely fall in love with this tour. Go back to the times of the Knights of St John in Malta, sit back and enjoy the drive through the famous fortified harbour of the Maltese Islands. 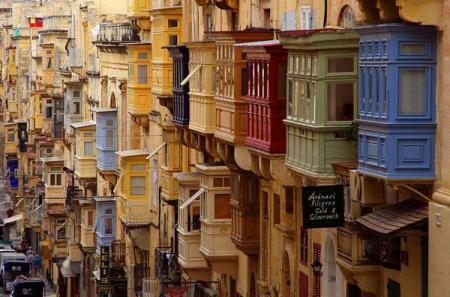 Malta’s capital city, a UNESCO World Heritage Site since the 80s, and the Capital of Culture for 2018. You can explore the Waterfront on foot before a drive through the outskirts of Valletta. The driver can stop you at the Upper Barrakka Gardens for some photos and a coffee. For those who are a little bit more adventurous, can go down the Barrakka Lift and get a ferry to the 3 cities. Take note of lift & ferry fees below. Note: Valletta is a pedestrian city and hence this tour is not focused on the highlights of the capital city for this reason. If you wish to visit Valletta only, we can offer transfers to and from Valletta and you can spend as much time as you want here. If you cross over by ferry, the driver will collect you from Cospicua where the ferry stops and take you to Senglea. If you don’t opt for the ferry ride to the 3 cities, then the driver will continue his route to Senglea and you will pass through Cospicua on the way to Vittoriosa. Cospicua is mainly known for the docks which provided a living for the local people since the Phoenician times, but also leaving the locals vulnerable when Malta's rulers were at war. One of the main docks in Cospicua was renovated and a University is currently being built in the area. Senglea got its name after Claude De La Sengle, the grandmaster who built it. The narrow streets hold a number of beautiful aged buildings. The driver will take you to Gnien il-Gardjola. This is a look-out garden standing at the edge of Senglea Point, giving you a magnificent view of Valletta and the Grand Harbour and the nearby dockyard. If you wish, the driver can also take you to visit the highly revered and miraculous statue of Christ the Redeemer which is located in the Senglea Basilica. Vittoriosa, named by Grand Master La Valette as the ‘Victorious Town’ was the first home of the Knights when they arrived in 1530. It contains many important architectural riches. The Knights `auberges' (inns of residence), palaces and churches here are older than those in Valletta. 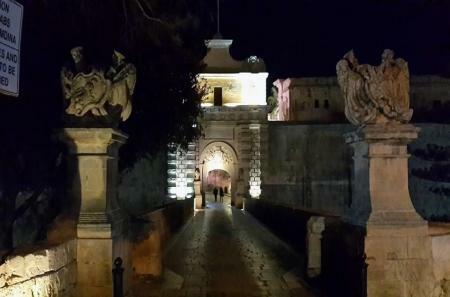 Highlights include the Church of St Lawrence, the Inquisitor's Palace, Fort St. Angelo and the Maritime Museum. The driver will allow a few hours for you to roam freely through the winding alleys of this medieval town. Apart from the highlights mentioned, you can also have lunch at the Waterfront or enjoy a train ride around the three cities. Take note of attractions’ entrance fees below.